I have been working through the ThruLines for descendants of the Frazers from County Roscommon. I recently worked on the James FrazerLine and will now work on the Archibald Line. 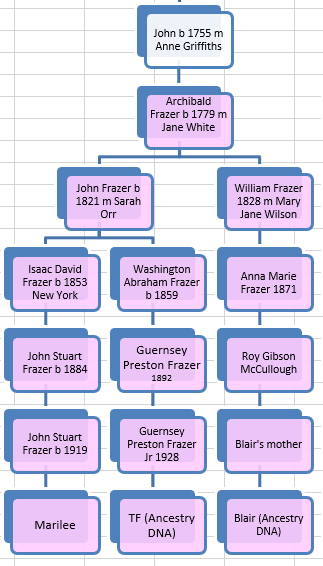 At the top of the tree, there is Violet and James Frazer. 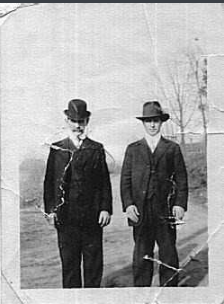 It is believed that these were two Frazer first cousins. Violet was a daughter of Richard and James is believed to be the son of Philip Frazer. That makes Gladys my 3rd cousin, once removed. Gladys is in a good position for DNA comparisons as she is in a generation ahead of me and ahead of many others on the tree. 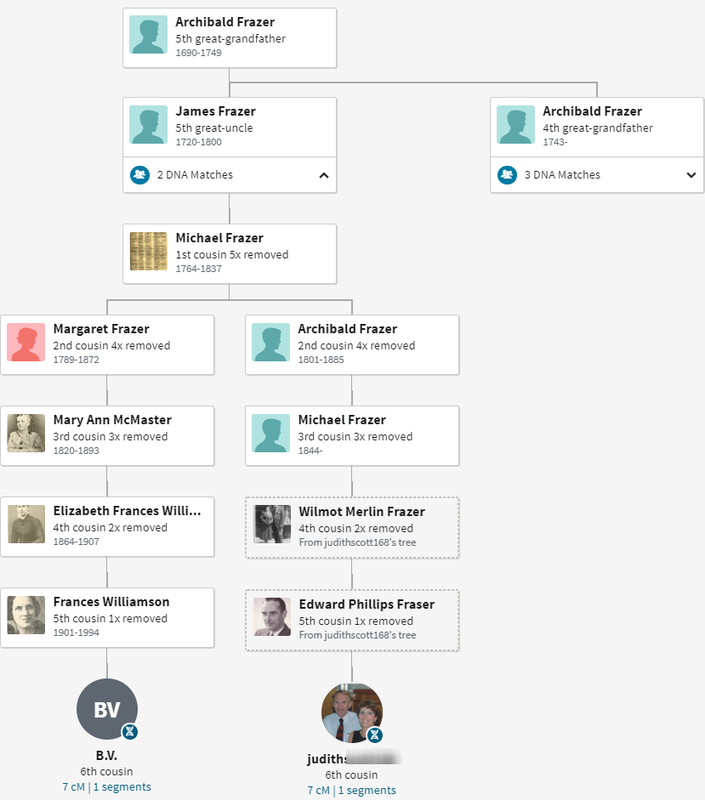 Richard Patterson Frazer was my 2nd great-grandfather George’s brother. George stayed in Ireland and Richard moved to New York State and then to Canada. Richard died in Manitoba in 1901. 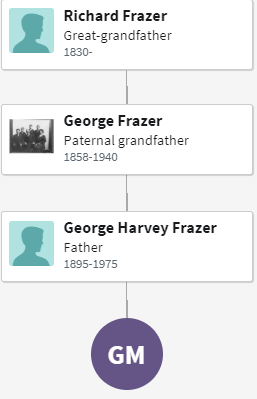 This splitting up of Frazer families was quite common due to difficult times in Ireland. Gladys shows no DNA matches at this level. From the chart above, she matches Bill, but he didn’t test at AncestryDNA. He tested at FTDNA. If Gladys had matches here, they would be at her 2nd cousin level. Again, she would have DNA matches but they tested at FTDNA. My son JJ got a perfect score of 22% out of 22%. Sharon got a lower score for getting too much of a match at 72 cM. However, all the levels of matches are good. This is where things get interesting as there are multiple Frazer Lines. Part of the problem is that we don’t have a name for Richard’s wife. 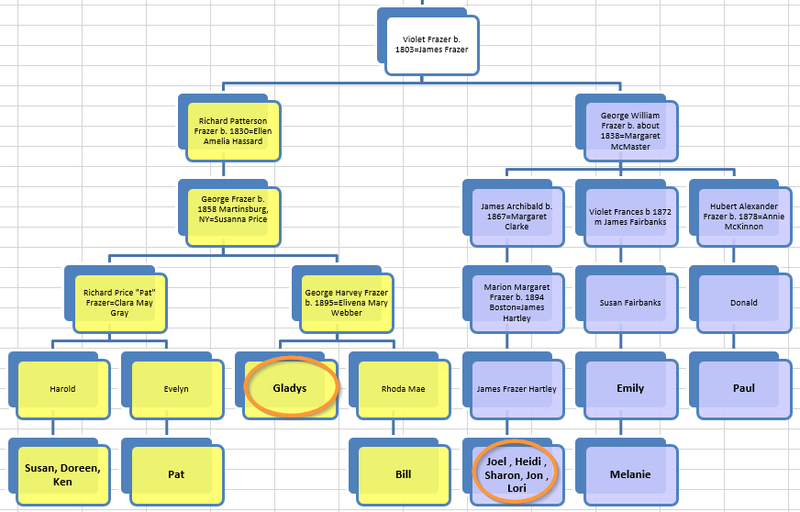 Here Michael has a DNA match higher than Ancestry would like, but he also matches Gladys on the Archibald/Stinson line. See, Michael and Gladys match on the three segments. That is a possible sign of multiple common ancestors. This is the line I call the Archibald/Stinson Line. Now things are heating up. Here is Michael again as expected. 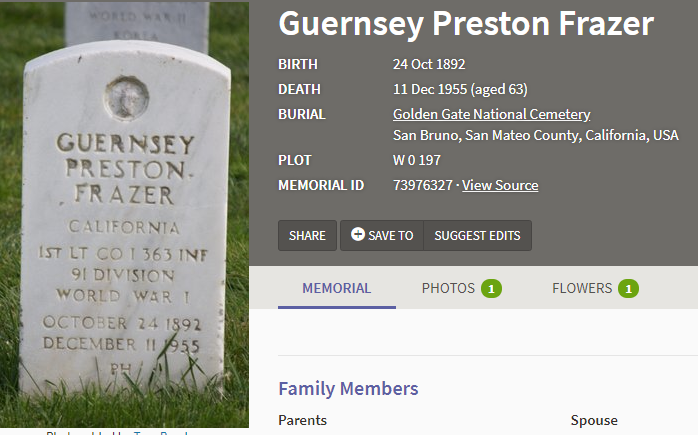 That means that someone put in Michael and Gladys’ trees correctly and Ancestry interpreted those trees correctly. I’ll start with two on the Mary Frazer Branch. Here is a good representation. 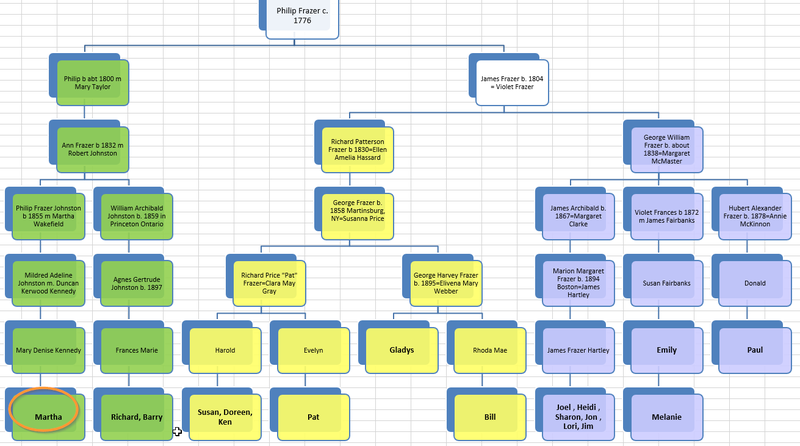 I didn’t have the son Edward Branch on my previous Frazer DNA tree. Cathy is already in the Frazer DNA Project. The above chart shows the many matches that Gladys has with people on the Archibald Frazer/Stinson Line. Daniel’s mother and grandmother are from his own tree. 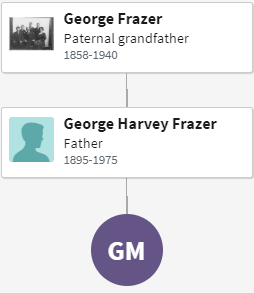 His Frazer great-grandmother is from Maria’s tree and Edward is from my own tree. 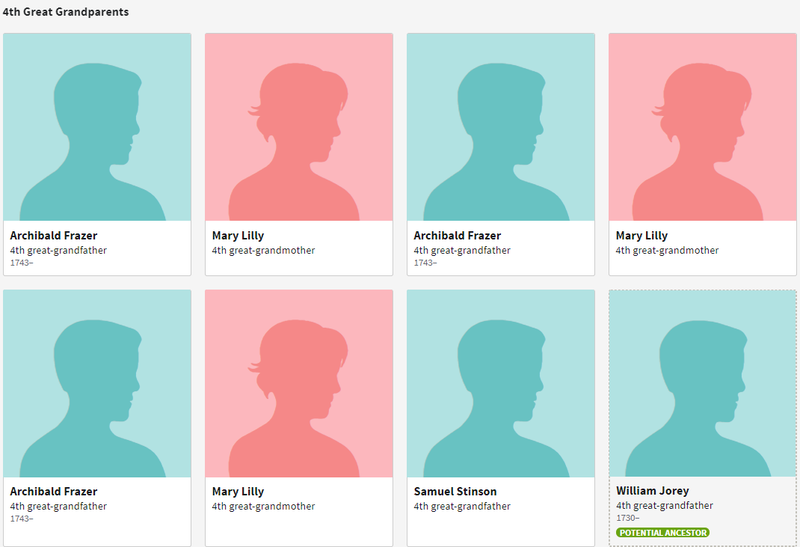 Ancestry has done some computer collaboration work. I’ll build a private tree to see if I can get the same thing that Ancestry did. Mary’s mom was also born in New York. 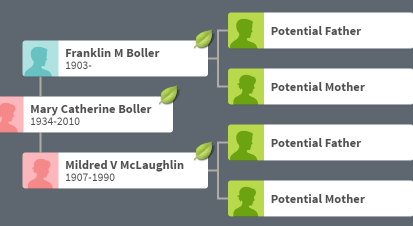 Ancestry has hints for me, but I don’t want to go with the hints now. 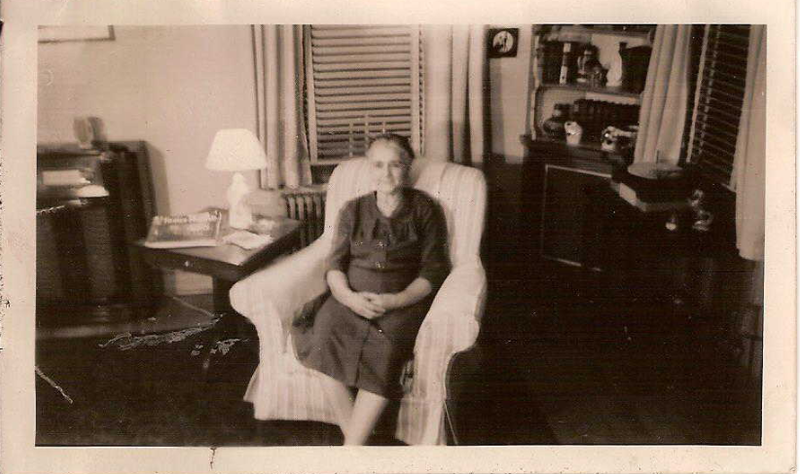 The hint is that Mildred’s mom is Mary Winnifred Frazer. 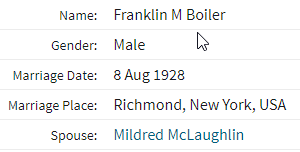 This says that both of Mildred’s parents were born in Brooklyn, NY. 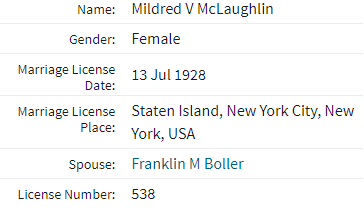 According to this record, Mildred’s mother was born in England and her father in New York. 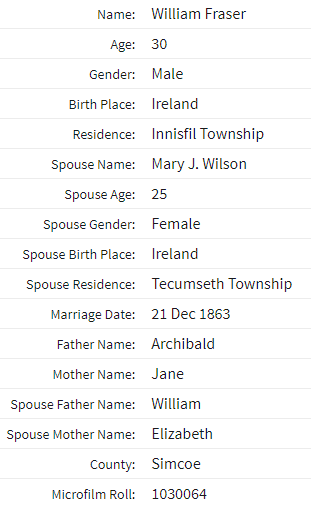 All four of Mildred’s grandparents were born in Ireland based on the 1920 Census. This shows Mary coming to the US in 1871, so at about age 2. The father as Fred seems to be an error. 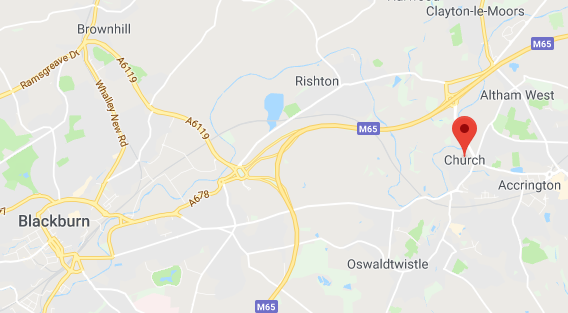 This shows the Link between New York and Lancashire. But how do I get back to Ireland? I would say that this record gives the best birth years for Edward Frazer and Winifred Russell. 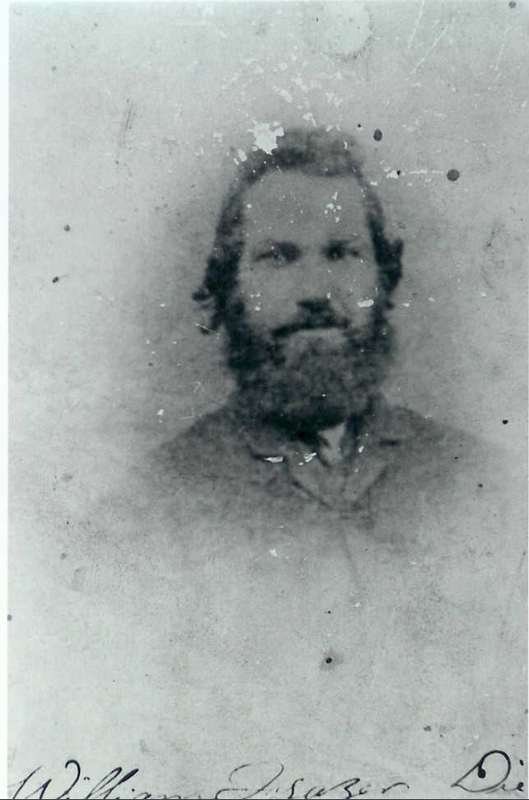 Here is Edward’s older brother Alexander born about 1836. This is a critical record. 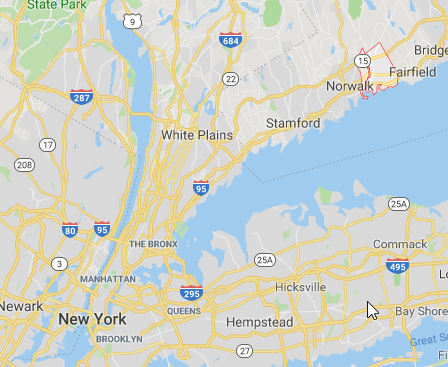 From here, Edward moves with his family to New York. Alexander moves back to Ireland and marries there. Then some of Alexander’s children emigrate to the US. I am thinking that Alexander shown above was really born closer to 1836 and Edward shown above was really born closer to 1840. I just need to update Alexander’s birth year. 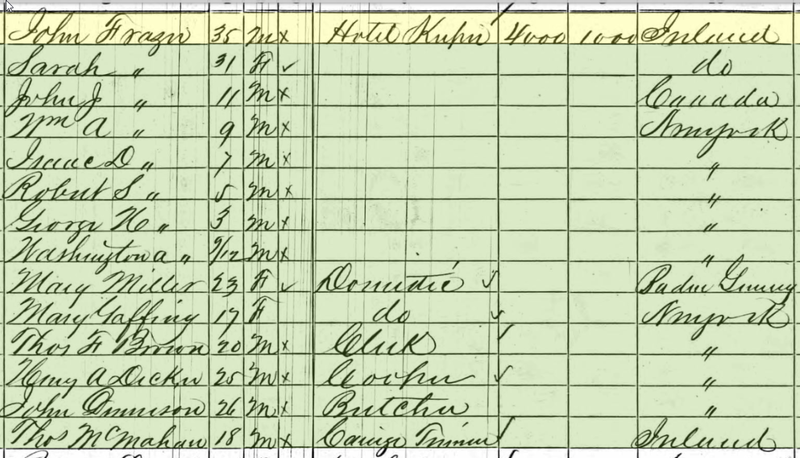 Based on this Census, he would have been born about 1839 or 1840. That is closer to the 1836 birth that I had based on his stay in Lancashire. In fact, Charles was living in the same house with Annie. Lilian is Brenda’s great-grandmother. It looks like Annie and Charles may have followed their older brother Thomas John to Westport, CT. This is where the ThruLines appear to work well. I can’t tell who Alan’s mother is. She is probably still alive or at least shown that way on Alan’s tree. Because of that, I can’t see any information about her. However, Ancestry must know enough about her to link her as the daughter of John William Bernard Foxwell. The proper way for me to check this is to build a tree for Alan and see if it agrees with Ancestry. I think it will. The Frazer Nation keeps expanding. This both simplifies things and complicates them at the same time. I have covered Philip and Archibald. Gladys also descends from Richard, but I don’t see him here. Let’s look at John. Here is TF who sounds familiar and Blair who doesn’t sound familiar. Both of these matches are beyond the 5th cousin level so pretty far out. TF has a private tree and Blair’s tree is public. If the configuration is right, TG and Blair would be 3rd cousins to each other. 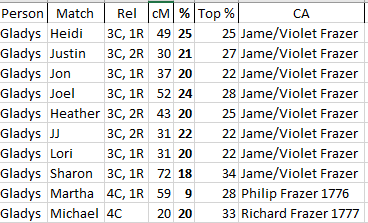 The John Frazer Branch doesn’t get much attention, so these matches are interesting. 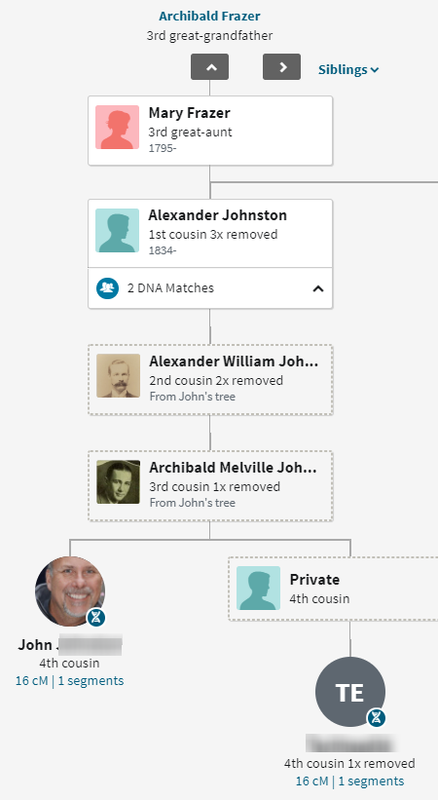 From what I can tell, this shows that John had William, Stewart, Archibald and John. Out of those it looks like William and John went to the USA. 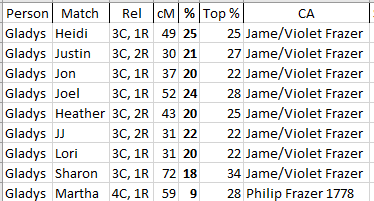 If I have this right, it looks like TF follows down from Archibald to John James. 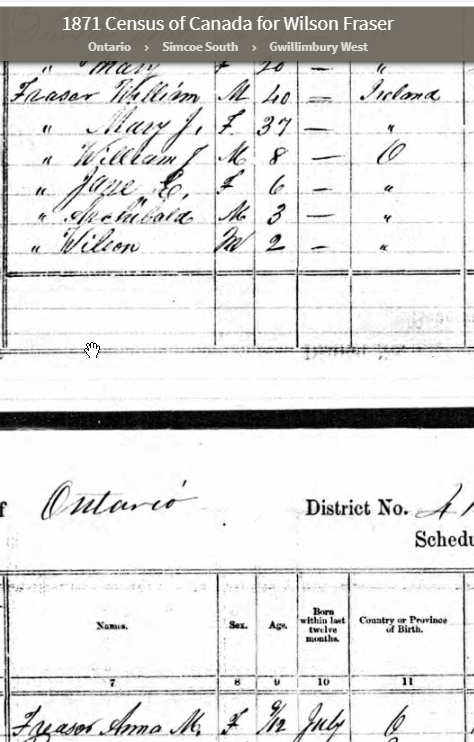 This Census has John J born in Canada about 1849. 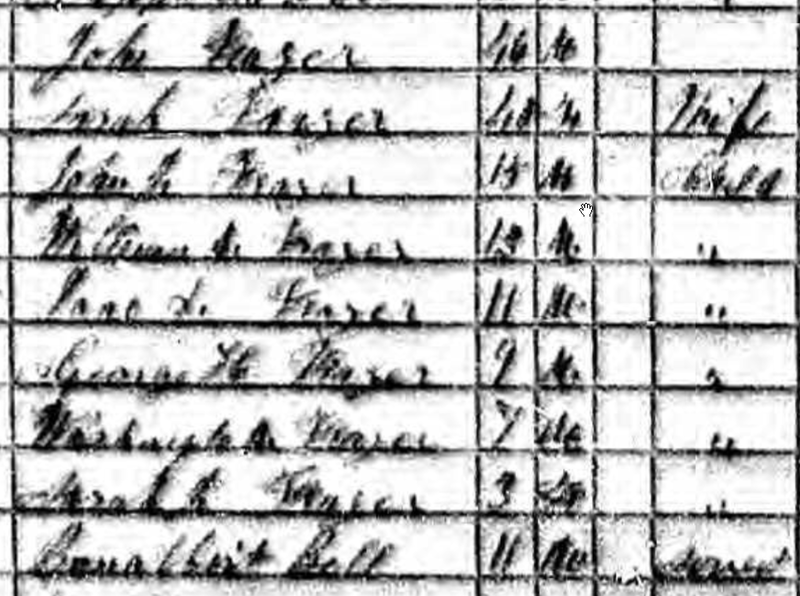 This Census also gives a more exact date for the birth of Washington Frazer. 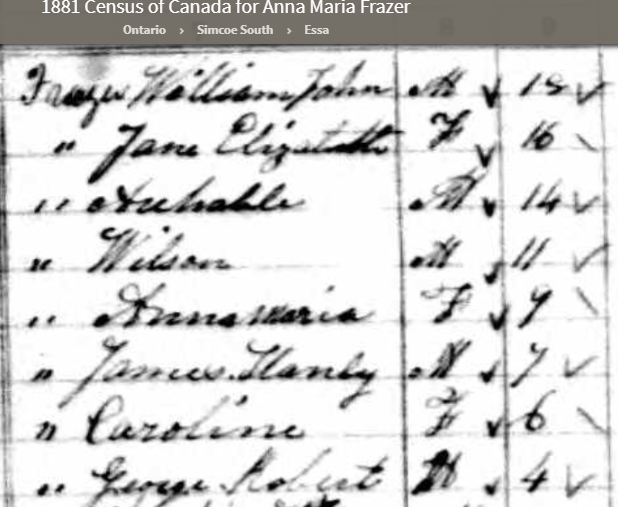 If the family was in Canada in 1849 and in Niagara County in in 1851, they may have missed the Canadian and US Census. 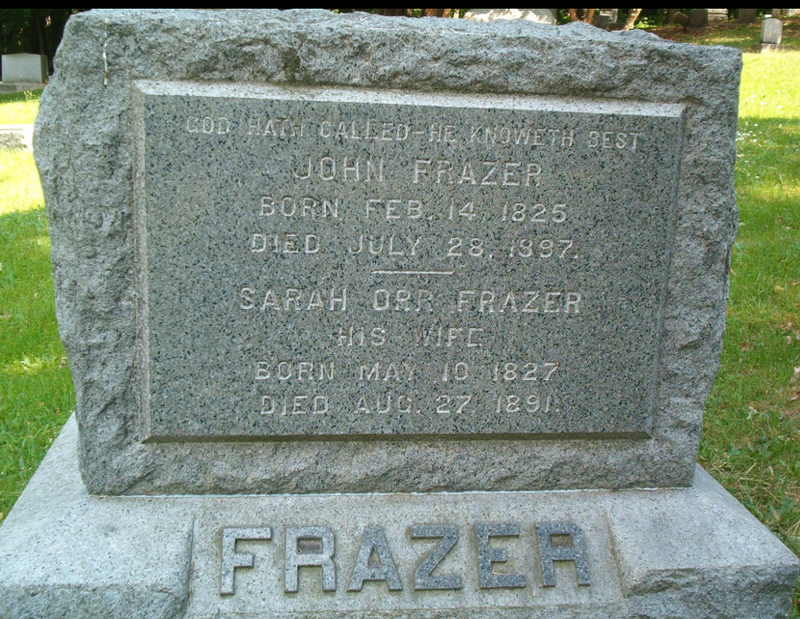 I have that John Frazer was married to Sarah Orr based on the grave stone, but I have seen another marriage record for John Frazer – though possibly a different John. 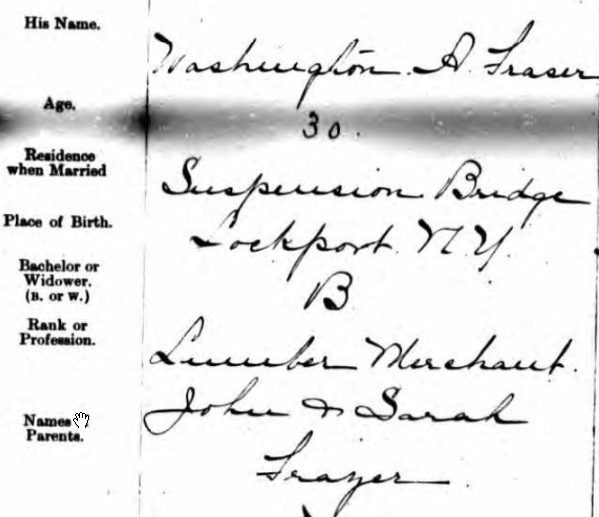 I could probably clear that up by going through all of Sarah’s children’s records to try to find a maiden name for Sarah. My guess is that this could be the same person as the John Frazer who lived in Lockport, NY. From John’s grave marker his birth is said to be 14 Feb 1824. 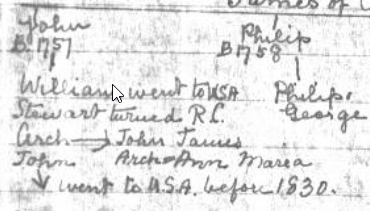 My guess is that John may have been born 14 Feb 1821 and baptized four days later. 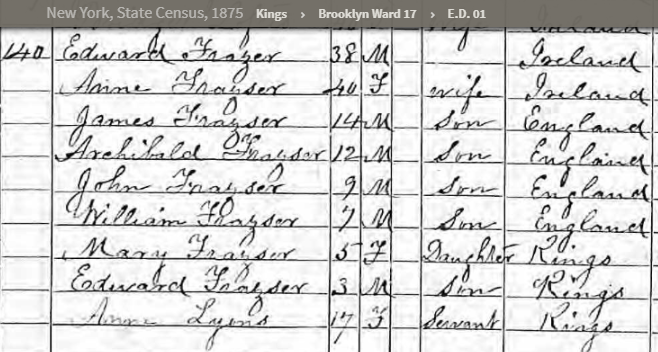 Most of the Census records indicate that John was born around 1824. However, I few indicate that he could have been born earlier. 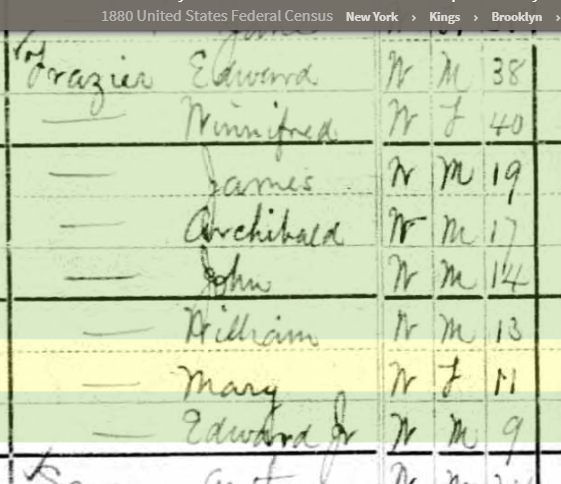 For example, in the 1865 New York Census, John is listed as being 46 which would put his birth at 1819 or 1820. If these ages are right, then it would appear there were no parents in the house at the time of the Census. Here is Essa where the family lived in 1881. 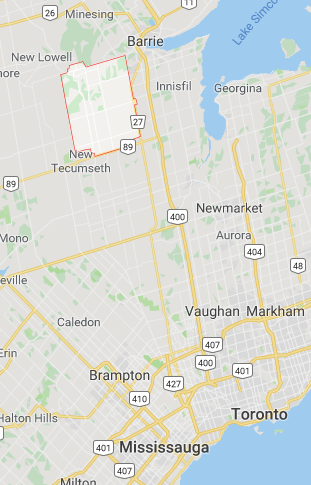 The sister of one of my McMaster ancestors lived in nearby Tecumseth for a while. I don’t know if this was a coincidence or not. 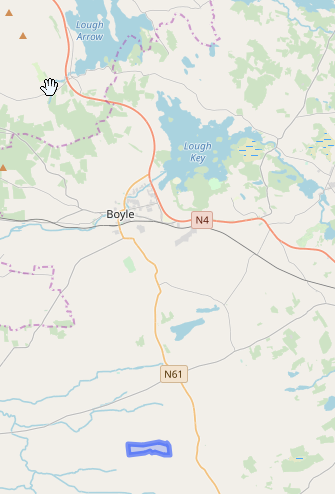 The couple married in Cookstown where the red marker is below. The bride and groom were from Bradford and witness George Frazer was from Bond Head. 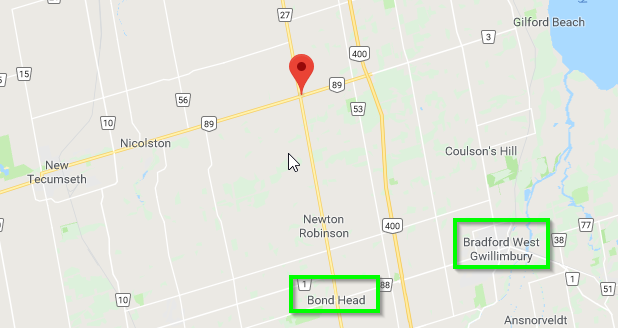 Gwillimbury was already shown right below Bradford above in the previous map image. I don’t know if the White above was in the records or someone’s interpretation. Here Tecumseth comes into play again. This place was renamed New Tecumseth on the map I showed above. I believe that this tree ties in fairly well by DNA and genealogy. By the way, Marilee tested her DNA at MyHeritage, so would not appear at AncestryDNA. 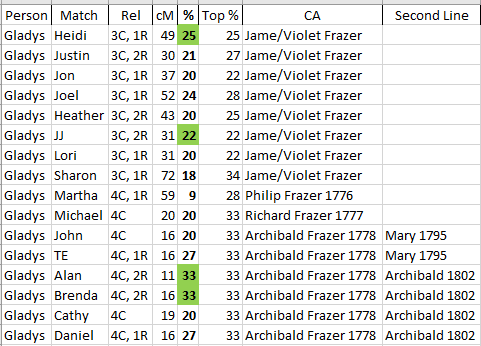 To show their matches with Marilee, TF and Blair would have to upload to Gedmatch or MyHeritage. People should be skeptical of these ThruLines that are at a distant level. That means that they should be checked out for accuracy. 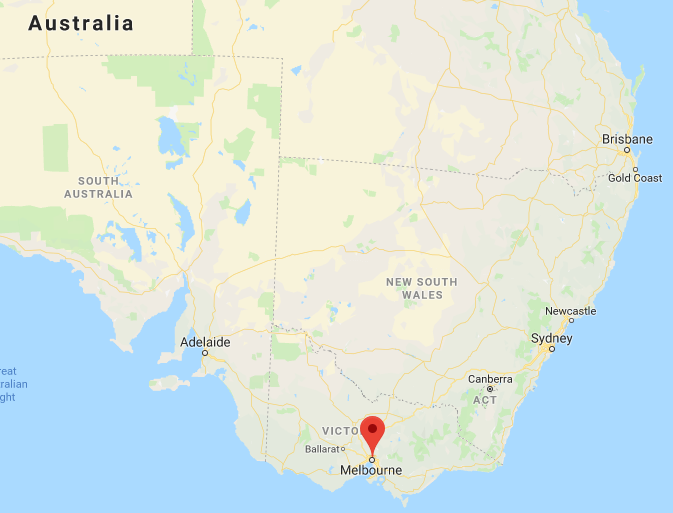 In the past, I have noted possible additional connections that may by-pass the route all the way up to Archibald from 1690. 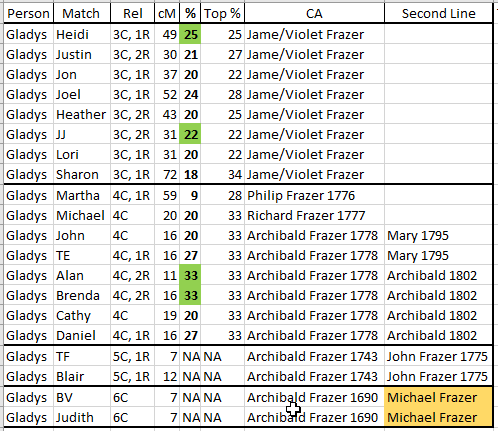 The fact that these matches are both on the Michael Frazer line may be significant. 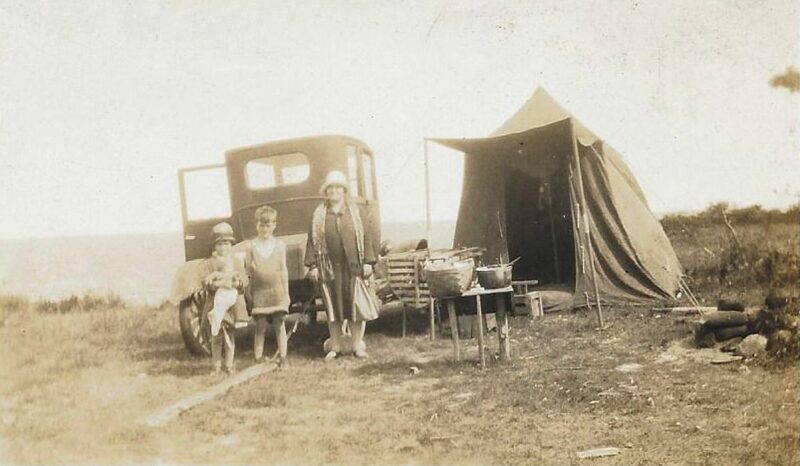 Also Margaret Frazer and three of her daughters lived in the area of Tecumseth that I mentioned. I match BV at quite a significant level; however, the match probably represents the McMaster side. 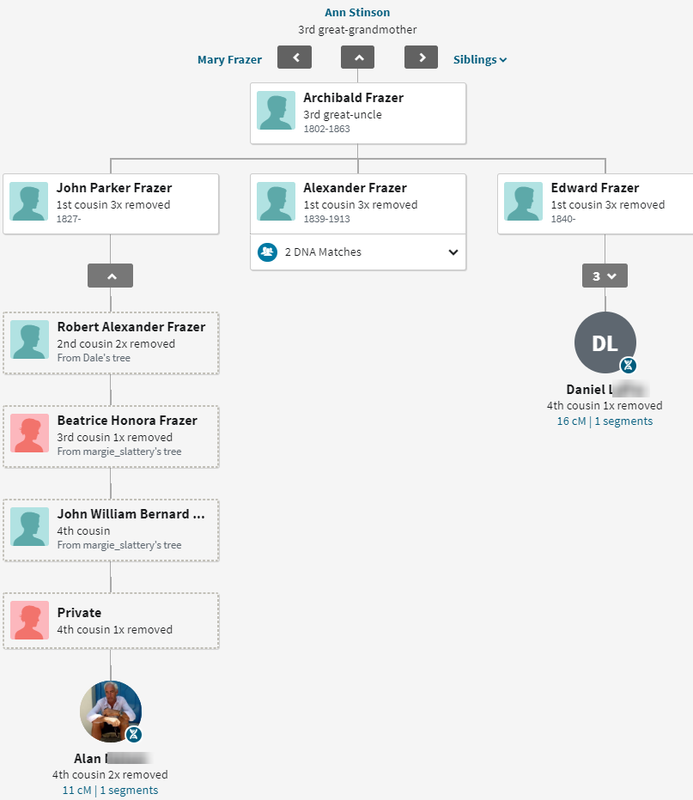 Perhaps there are other McMaster, Frazer or other connections that I am missing. I have Gladys’ Thrulines into 3C, 4C, 5C and 6C. James and Violet Frazer are from Philip and Richard below. 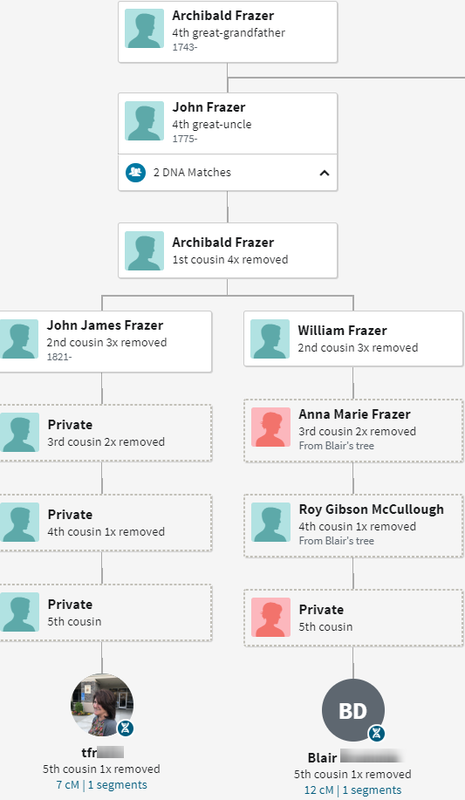 The Archibald Frazer 1778 matches are not in the Philip or Richard Frazer groups. 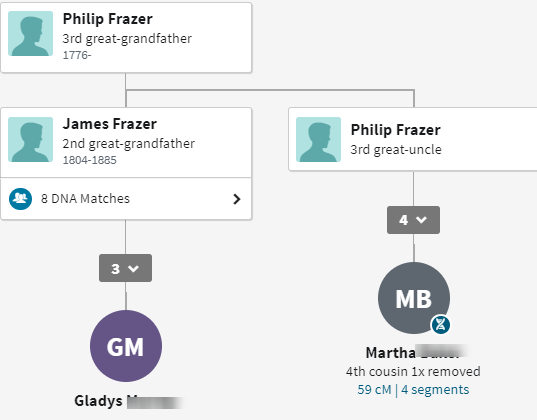 Gladys’ matches with TF and Blair seem to be valid matches tracing back to John Frazer born 1775. Gladys has a good representation of Frazer matches. 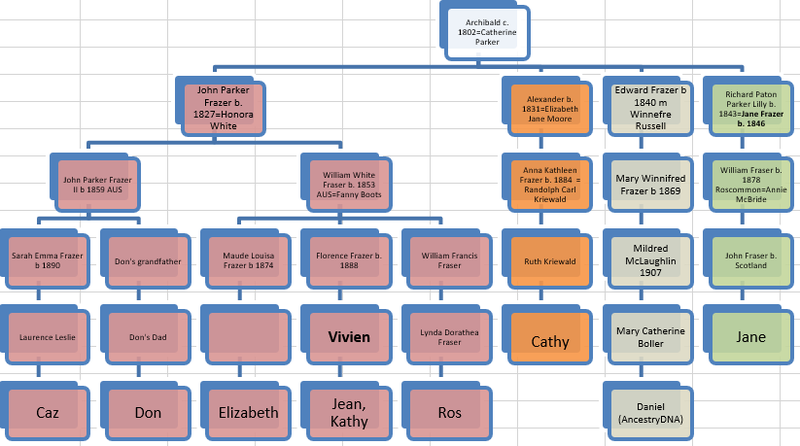 She also matches two people on the Branch of James Frazer’s son Michael. 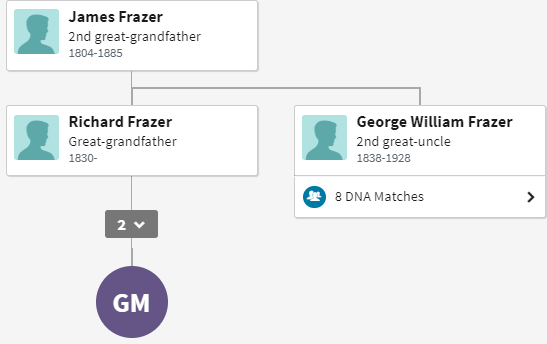 From other DNA match analysis, my sense is that the common ancestor of Archibald Frazer born about 1690 could be too far removed and that there could be a better choice for common ancestor. 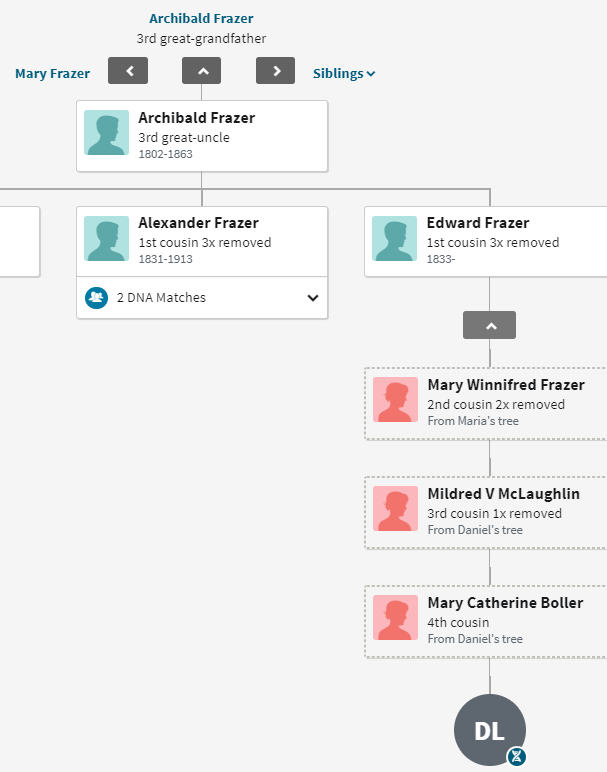 However, the common ancestor of Archibald Frazer from 1690 is not rulted out either. 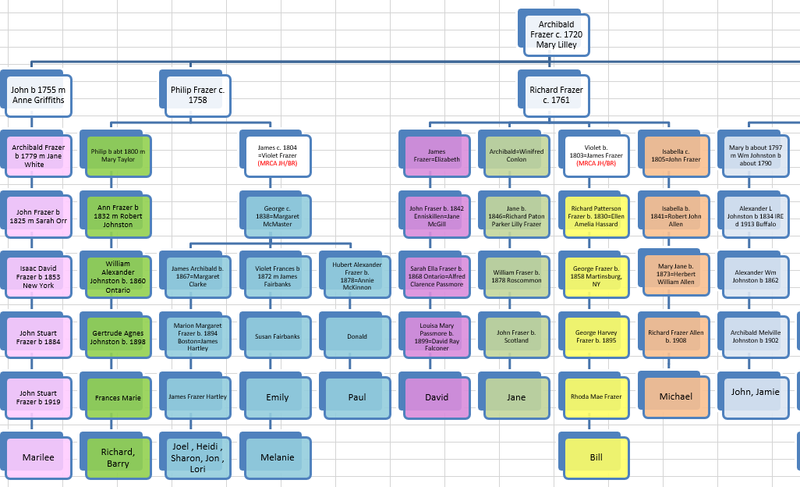 It took a while to go through Gladys’ ThruLines, because I checked on the genealogy of some of her matches. 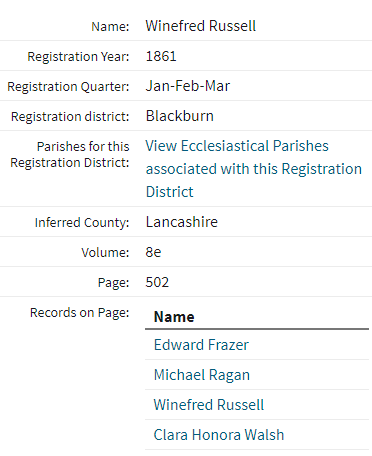 I found a new important record for brothers Edward and Alexander Frazer who were living in Lancashire in 1861. 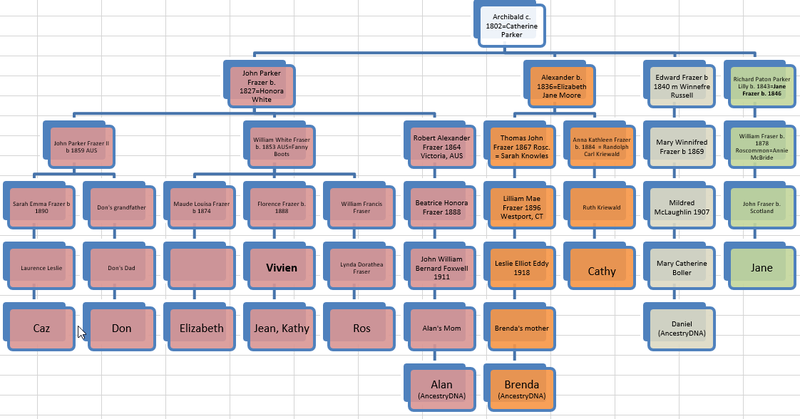 I was able to link these families back to the Frazers of North Roscommon, Ireland. 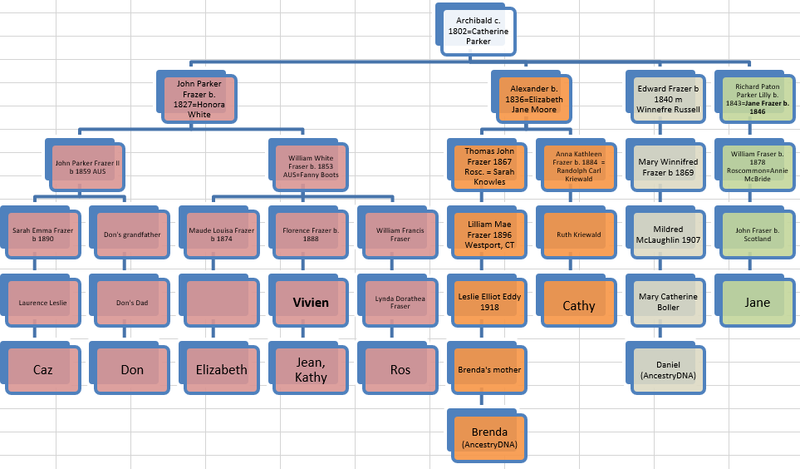 I was able to add two more Branches to the John Frazer Born 1775 Line to my combined DNA match/Frazer genealogy chart. 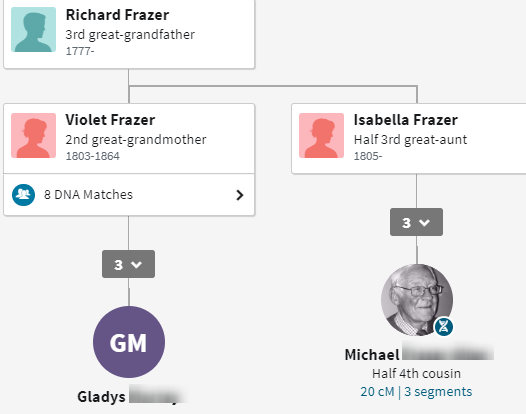 I looked at Gladys’ match with two descendants from the Michael Frazer Line. 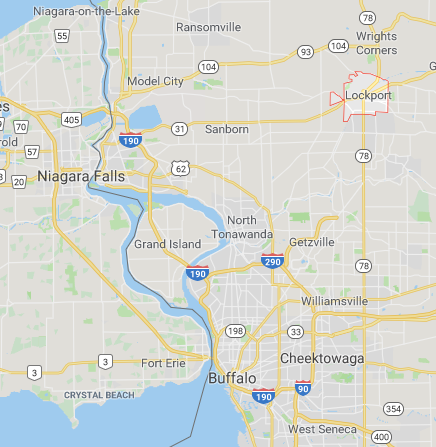 I was familiar with the connection and have made suggestions in the past haveing to do with the McPartland Family. Thanks Ros, I was working on another Blog on Jane’s ThruLines, but saw that hers were missing. Then I started a Blog on Michael’s ThruLines and the ThruLines changed in the middle of writing the Blog. One of the changes was that Jane appeared in at least one of Michael’s ThruLines, but then Cathy’s connection to Michael disappeared. 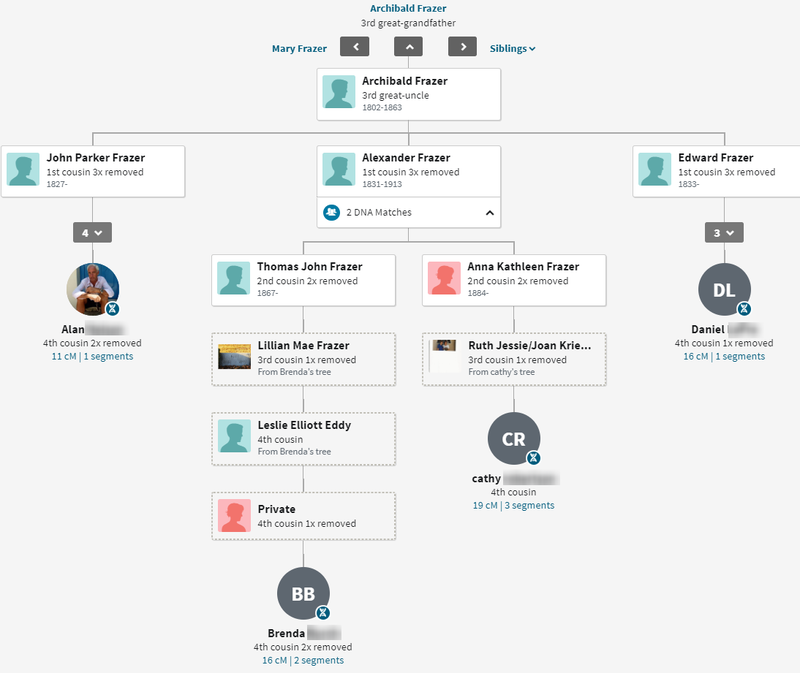 I guess things are still settling down at AncestryDNA. with a Thomas Adams who is a grandson of Archibald Andrew Frazer son of Alexander and Lizzy Moore. I have corresponded but he has no further info. I couldn’t work out why I should have such a strong match with the Archibald line…maybe you can! My shared matches include T.H. who is Terri Heagy great granddaughter of my grandfather Edward ‘s oldest brother John A P Frazer of Spokane. 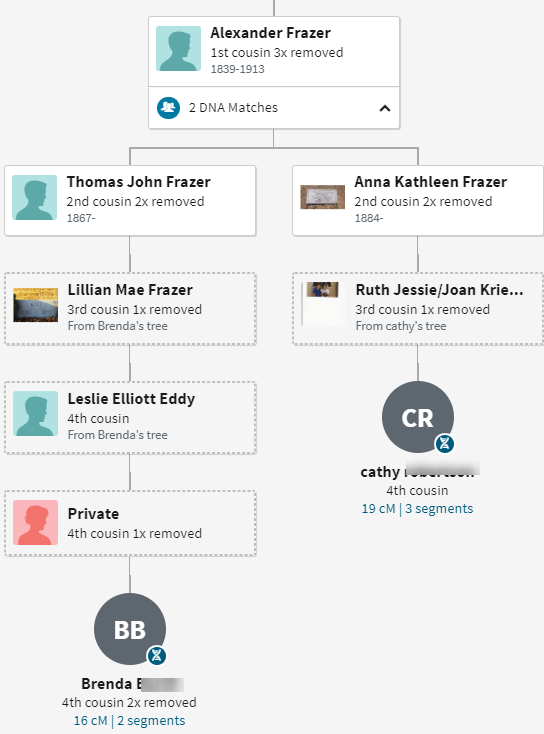 Previous PostPrevious Cousin Rusty’s YDNA – MacFarlane or James?